Would you or someone you like to purchase a home at a reduced price? Are you willing to do some repairs or updates on a home so you can buy a house below market value? Now it is a bit easier to find homes that may be a great value. 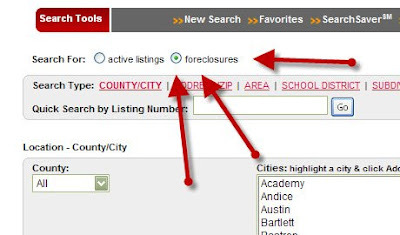 On my AUSTIN AREA HOME SEARCH system, there is now a new feature that allows you to SEARCH FOR FORECLOSURES FOR SALE IN AUSTIN. You can select all of your criteria just like a regular home search and select the "foreclosures" button next to the "active listings" button. This will find all of the available foreclosed homes that are listed for sale in the Austin MLS. The results will include any available photos and details of each house. Every foreclosure is not necessarily a good deal. Banks that foreclose on properties are usually located out of the area work with local REALTORS and appraisers to try to assess the current market value of the home and to give advice on any repairs that can be made to help sell the home in about 60-90 days. Just like dealing with sellers of a home, some REALTORS will over price a home even when it is a foreclosure. The process is slightly more difficult and may take a bit longer so you want to be working with a professional to make sure you are getting a GREAT DEAL! If you are able to find a great deal on a foreclosed house in the Austin area and you can take advantage of the $8000 FIRST TIME HOME BUYER TAX CREDIT, it is a decision that you will look back on as the greatest choice you have ever made. It is a unique time in AUSTIN REAL ESTATE that you are able to find a deal AND get money back from the government. If you are interested in buying a foreclosure, go ahead and search on my site. If you have any questions about the process or if you would like to see any of these homes in person, please contact me today by email or call (512)638-5885. Posted by Brian W Martin REALTOR for The Pinnacle Group of Keller Williams specializing in Assisting Buyers to find GREAT DEALS ON AUSTIN HOMES. NORTHWEST AUSTIN HOMES: $8000 Tax Credit- How to get a 10% rebate of your homes value. This is a follow up to my last article $8000 Federal Income Tax Credit: First Time Home Buyers can get an $8000 tax credit for buying a house this year. Over the last couple of days, I have been thinking a lot about this $8000 tax credit that is being offered to first time home buyers that purchase a house, condo, town home etc. in 2009. While it seems like a good deal for people that are planning to purchase a home anyway, I have been thinking about if it will actually stimulate those people who were not already looking to purchase a house. For most first time home buyers in Northwest Austin, they will be looking to spend between $175,000 and $225,000 which is basically the range of average sales prices in the area. 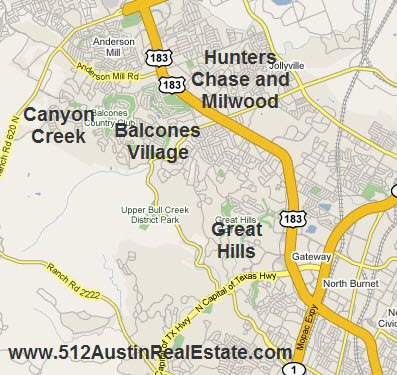 As you get closer to Balcones Woods or Great Hills and closer to Downtown Austin, it is more difficult to purchase a home in this range but for the most part, that is the range. When someone purchases a home for $200,000 in 2009, if they are a first time home buyer and they fit into the other criteria, they will receive a tax credit of $8000 this is equal to 4% of the sales price. That is pretty good if you consider the money will not have to be repaid and it is basically given as cash, especially if you file the credit on your 2008 taxes. You would get the money back pretty quickly. If the purchase was made with an FHA loan (with 3% minimum down payment) you would actually receive more money with the rebate than you initially put down on the property in the first place. Pretty good deal. Now lets look at a great deal. The legislation allows for a tax credit up to 10% of the purchase price up to $8000. This means that is you were to buy something for less than $80,000, you would actually receive $8000 or 10% of the purchase price. That is pretty amazing if you think about it. During times of decent appreciation it could take up to 2 years to gain this much equity in a home. Now is a unique time to actually get 10% of the purchase price of your home rebated back to you in a short amount of time. For some it makes sense to file with their 2009 taxes but either way 10% is substantial. Are there available Northwest Austin Homes for less than $80,000? Lets check it out. Here are Homes under $80,000 in Northwest Austin. Contact me today to speak more about how you can take advantage of this limited time opportunity. $8000 Federal Income Tax Credit: First Time Home Buyers can get an $8000 tax credit for buying a house this year. $8000 Federal Income Tax Credit: First Time Home Buyers can get an $8000 tax credit for buying a house this year. Congress has recently enacted legislation that allows first time home buyers to receive a credit of up to $8000 on their income taxes. Unlike "credits" of the past, this will not need to be repaid. It is a dollar for dollar credit. This means that if you buy a home in 2009 and at the end of the year you owe $1000 in taxes, you will actually receive $7000 after filing for the $8000 tax credit. This new legislation definitely provides a fair deal of opportunity for prospective buyers. It also raises a lot of questions which I will address here. Who can get the $8000 tax credit? How is the amount of the credit determined? How do I file for the $8000 tax credit? Do I need to apply? What types of homes qualify for the $8000 tax credit? Can I claim the tax credit on my 2008 Federal Income Taxes or just 2009? Can the tax credit be used as a down payment? I don't have enough of a tax burden to have $8000 of tax burden credited. Can I still get the refund? Who can get the $8000 tax credit? The first qualification is that you are a first time home buyer. First time home buyer is a term that is defined by anyone who has not owned their primary residence for at least three years prior to the purchase. The tax credit amount is reduced for buyers with a modified adjusted gross income (MAGI) of more than $75,000 for single taxpayers and $150,000 for married taxpayers filing a joint return. Taxpayers with MAGI of more than $95,000 (single) or $170,000 (married) are not eligible for this credit. How is the amount of the credit determined? The tax credit is an amount equal to 10% of the purchase price up to $8,000. Basically this means that properties purchased by eligible buyers for more than $80,000 receive the $8000 credit. Properties bought for less than $80,000 would receive 10% of the purchase price as a tax credit. How do I file for the $8000 tax credit? Do I need to apply? Filing for the $8000 tax credit is easy. The paperwork is done simply while filing your Federal income taxes. Home buyers should complete IRS Form 5405 to determine their tax credit amount, and then claim that amount on Line 69 of their 1040 income tax return. What types of homes qualify for the $8000 tax credit? Any home that will be used as a primary residence. This can include single family residences, condominiums, town homes, manufactured (mobile) homes and even a houseboat. Can I claim the tax credit on my 2008 Federal Income Taxes? Yes. The legislation allows the credit to be claimed on 2008 taxes that have not been filed even if the purchase is made in 2009. This means that you can choose which year it would be best to offset your income if the purchase is made in time for 2008 tax filing. Can the tax credit be used as a down payment? No...Yes...well, kinda. Home buyers will receive the credit after the home is purchased so it can not be used for the down payment. However, qualified buyers could purchase a home in 2009 and have someone gift the down payment to them, which is as low as 3% with FHA financing, file their taxes for 2008 with the credit included and return the money to the family member/friend when they receive their tax refund. I don't have enough of a tax burden to have $8000 of tax burden credited. Can I still get the refund? Yes. Even if you have a refund, the credit will be added to it. For example, if you were to receive $1500 refund on your 2009 Federal Income Taxes, you could receive $9500 with the $8000 First Time Home Buyer tax credit included. If this applies to you, this is the perfect time for you to buy a home. There are great deals available and with an incentive like this, it should make the decision to buy a bit easier. There is a follow up to this article: NORTHWEST AUSTIN HOMES: $8000 Tax Credit- How to get a 10% rebate of your homes value. This is new listing that I have on a great home in Cedar Park. This is an incredible price in the highly sought after subdivision of Buttercup Creek in Cedar Park, TX. Exemplary schools and location are just two features that draw home buyers to this area consistently. Do not delay in seeing this home because at this price it will not last! Contact me today for a showing.